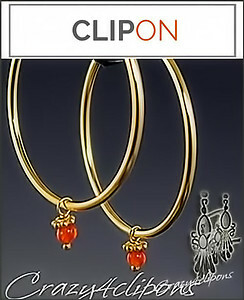 Features: These Med/Large Golden Hoop Clip On earrings are crafted from brass based metal and plated in gold. 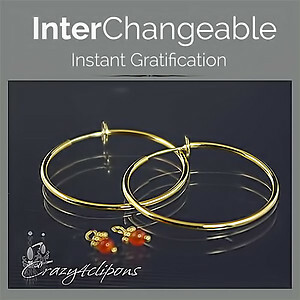 They feature a spring-loaded closure for everyone who has non-pierced ears but likes the look of stylish, fashionable hoops. What makes these non pierced hoop earrings extra charming? Each pair of hoops will ship with one extra "charm" that slides into each hoop so you can dress them up for different occasion.